The Lithuanian libraries as well as libraries all over the world are challenged by the network, information and technology revolution. The economic crisis in Lithuania and its Soviet background make this situation chaotic instead of well analyzed and planned. 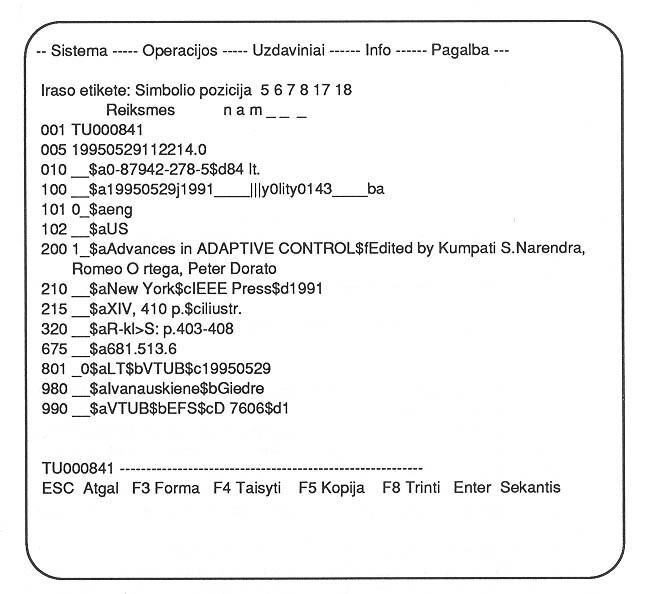 This article describes library automation in the Lithuanian academic libraries. There are 15 academic libraries in Lithuania as shown in Table 1. Though they differ substantially in their age, size and traditions, they all serve their students, faculty and staff. Large library collections alone do not solve the problems of information need of the Lithuanian academic society since there is a permanent lack of the most recent high quality information. New information technologies help to decrease the lack of information, but the implementation of these technological applications is very problematic in the Lithuanian academic libraries. The old traditions of library collection handling, the insufficient knowledge of the library staff on the usage of modern information technologies, and the poor financial situation of parent institutions are just some of the problems which create great obstacles in the implementation of new information technologies in the Lithuanian academic libraries. Inspite of these difficulties, new technologies have started at the most advanced Lithuanian libraries and are now spreading to other libraries. 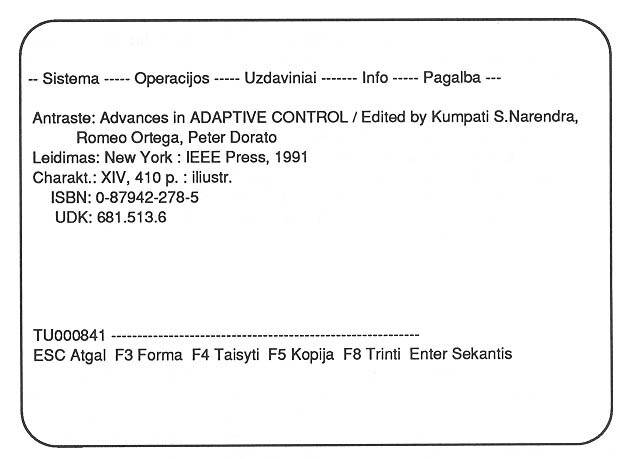 The first attempts of library automation in Lithuania were made in the 1980's. However, it's only during the last 2-4 years that the results of this technological revolution in library automation became visible (Table 2). � The Kaunas University of Technology and Kaunas Vytautas Magnus Uni-versity Libraries had analyzed many integrated library systems. For choosing a system they had set up criteria, such as its functionality, compatibility with Lithuanian standards, etc. and the price compatible to their capabilities. In 1994 both libraries have chosen and bought the same integrated library system, CICERO. The system is developed by Dantek, a Danish Company. CICERO includes cataloguing in UNIMARC format, OPAC search, material registration, patron registration, cir-culation and statistics. Material registration, patron registration and circulation are barcode driven. OPAC search facility can be used for searching books by different bibliographic data elements, as well as by different statistical information. The CICERO OPAC search facility can be accessed from the World Wide Web information network. The system has been adopted to Lithuanian language and implemented in both libra-ries. CICERO runs on IBM RISC System/6000 Power Server 250 workstation under AIX operating system. Database transactions are managed by Informix database management system. The Kaunas Uni-versity of Technology Library has 11 PC workstations, and the Kaunas Vytautas Magnus University Library has 10. � The Klaipkda University Library has bought UNICAT, the library system developed by the National Library of Lithuania. The system supports data input according to UNIMARC format, classification and printing of bibliographical cards and is based on the Novell network. The library has 5 PC workstations. B. Academic libraries that either have developed or are developing in-house systems. The most successful institution in this category is the Vilnius University Library, which functions as an integrated library system with OPAC accessible via Internet. 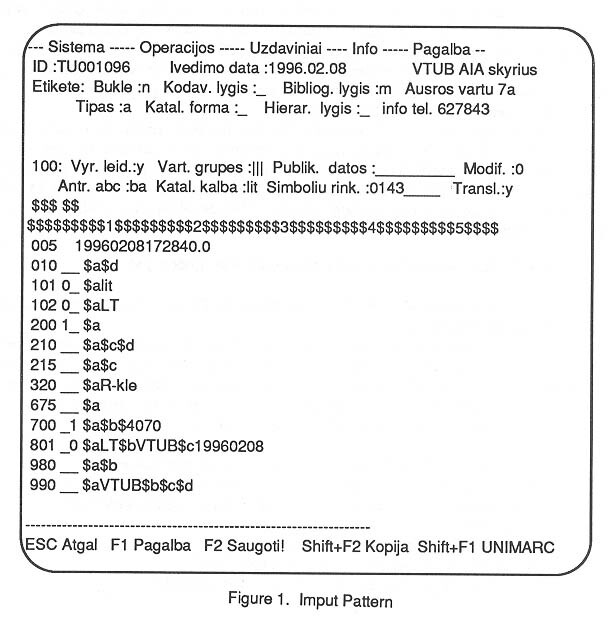 The system has been developed by specialists of the Vilnius University Computer Center on Norsk Data computers received as a gift from Norway in 1992, by using the database management system, SIBAS/R, pro-gramming language C and UNIQUE 4GL, special tools for database definition and manipulation. Acquisition and cataloguing modules were installed in the library in January 1993. Cataloguing module includes programs for bibliographic description of acquired publications, and the storing of that information in the database. It allows description of monographs and periodicals, and creation of piece-analytic bibliographic records in UNIMARC format. A year later OPAC was introduced for the library readers. Import-export module for the bibliographic exchange with other libraries based on ISO 2709 standard was created and tested with the Vilnius Technical University Library. The Vilnius University Library has 40 workstations in the Central Library building plus 5 workstations in the two branch libraries. The Vilnius Technical University Library started library automation in 1990. First of all, the bibliographical database, "Publications of the VTU Scientists", was created. This database is updated and maintained till now and runs on Micro CDS/ISIS software. Among separate automated library tasks the most important is a cataloguing module. This development is elborated on more in Section 3. C. Academic libraries that have not started their automation yet. Few of the academic libraries in this group have one PC and they are being used for random bibliographic tasks. � How many and how important library tasks are automated? � How many bibliographic records are to be created? � What hardware and software are used? � How much library automation is based on standards? 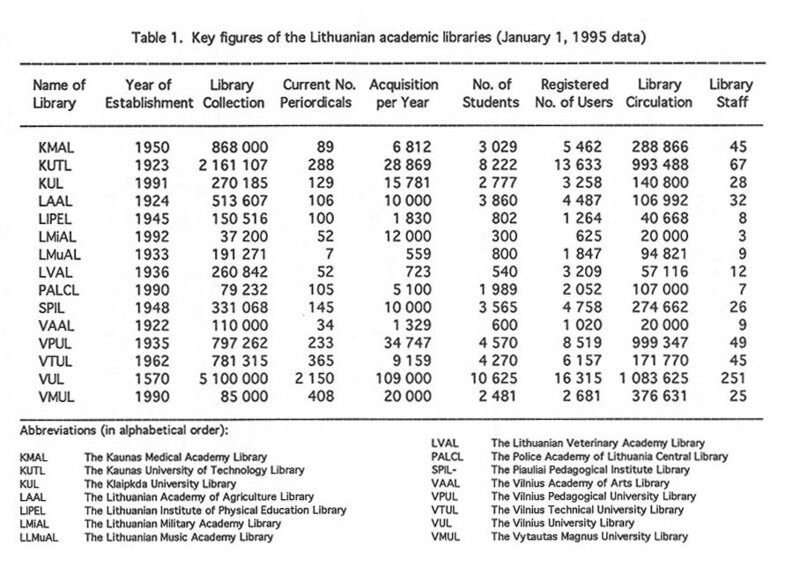 As already stated, the Vilnius Technical University Library started library automation in 1990. The development of a cataloguing module has been consi-dered as the most important activity. When we started work on the library catalog, we defined the main task for ourselves as "to start to accumulate bibliographical records of new literature so that at the first possibility they could be transferred into a modern library system which supports all international library, communication and information retrieval standards". For this purpose the cataloguing program was created. The program supports: � Data input - The program assures data input in full accordance with UNIMARC (it allows to input any field from UNIMARC and any amount of information in that field as it is allowed by UNIMARC). Figure 1 shows that the program provides the input pattern of most often used fields and sub-fields to facilitate the cataloger's work. � Data handling - the program assures editing, deleting, and record by record search by any subfield. � Data output - the program outputs data in three formats -- a full UNIMARC format (Figure 2), a card format (Figure 3) and a short structurized format (Figure 4). � Data storage - the program stores data in two formats: a UNIMARC text format and a card format. In the card format only data which need further handling is stored. All data is stored in the text format. 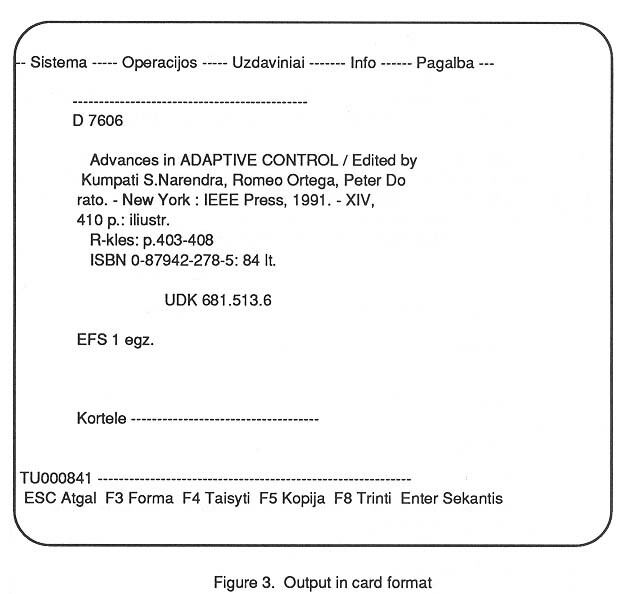 This text file is printed and used for preparation of catalog cards. � Data conversion from UNIMARC text format to ISO-2709. The program is working on PC in MS-DOS environment and supports Lithuanian, Russian and Latin scripts. Together with the experts from the Computer Center of Vilnius Univer-sity, the staff of the Vilnius Technical University Library tested the union catalog of the two University libraries. This also was a good opportunity to check on the main task of the system -- whether it was possible to install our data into an online library system which had modern network search possibilities. The VTU records were converted into ISO-2709 format and sent to the Computer Center of Vilnius University. Then they were imported into the database. This was the first step toward the union catalog and had enabled our patrons who had proper workstations to search in the catalog. The idea of the union catalog of the Lithuanian academic libraries was further developed by proposing the TEMPUS project, an integrated information sys-tems in Academic Libraries. This TEMPUS project has been approved by the European Community for the 1995-1998 academic years. � Riget InfoConsult , a consultation firm from Denmark. The main objective of this project is to improve access to information by establishing a joint database and installing decentralized integrated library systems in the above mentioned Lithuanian libraries. � retraining and providing continuing education to library staff and computer specialists. Another new information technology used in the libraries is CD-ROM databases. Half of the Lithuanian academic libraries have CD-ROMs. The libraries have standalone computers that are used as a CD-ROM workstation. In addition to a standalone computer the Kaunas Medical Academy Library has bought a system for CD-ROM network that is able to provide search for 100 users. The system consists of Logicraft LAN CD server with 7 CD-ROM drives, LAN CD server software and other equipment. The library subscribes for CD-ROM network Medline for 8 simultaneous users. Other libraries usually do not subscribe to CD-ROMs, because it is too expensive for them. Most libraries receive CD-ROMs as gifts. For example, at the Vilnius Technical University Library, 26 of 28 CD-ROMs were received from the exhibitors at the Central European Conference and Exhibition for Academic Libraries and Informatics held in Vilnius in 1993. The other 2 of the 28 CD-ROMs were also received as a gift. Because of the gift status, only part of the CD-ROMs are related to the university profile and interest. The most popular CD-ROMs at VTU are Applied Science and Technology Index, Compendex Plus Ondisc and Inspec Ondisc. Internet activities in Lithuania were started in 1991. Since 1994 Lithuania is an official member of Internet Organization. Currently not all Lithuanian academic libraries have access to Internet. Kaunas University of Technology and Vilnius University are the Internet nodes in Lithuania. Their libraries have direct connection to Internet and can use Internet more widely than other libraries can use dial-up connection. As mentioned earlier, the catalog of the Vilnius University Library is accessible via Internet and the CICERO OPAC search facility can be accessed from World Wide Web. But, at the present, neither the Kaunas University of Technology Library nor the Kaunas Vytautas Magnus University Library has this applica-tion. The most popular Internet tools are e-mail, telnet, gopher and WWW. Internet is also used to spread information about libraries or their resourses. The Lithuanian proverb says "If God closes the door, He opens the window somewhere else." The door to relatively safe and secure existence established on a level of academic hierarchy is closed. Now libraries must compete with other departments of academic institutions for their share of the shrinking financial pie and attention from superiors. But new information technologies might become the window to the world information resources for the Lithuanian academic libraries. To break through this window is a very hard and long process and it is closely related to the understanding of importance of new information technologies for library services. We are ready to meet these challenges!